For my third installment on handheld pies, I'm going to go with something savory. I'm imagining sweet, creamy, cheesy goodness baked in a flaky pie crust. Thanks to my helpers Maddy & Stella, we were able to crank these out in good time. Cut the butter into small cubes and place in the freezer while you assemble the dry ingredients. In a food processor pulse together the flour, sugar and salt. Then spread the butter cubes around the flour and pulse until small pea sized balls form. Then add the ice water 1 tablespoon at a time, pulsing between additions. Use just enough water so that the dough is moist enough to clump together. Turn the dough out onto a work surface and gather it up to form a ball. Press and gently knead together. Do not overwork. Use a large sheet of plastic wrap to wrap the dough and press it into a round disc. Refrigerate for at least two hours or up to 3 days. In a large bowl, using a hand mixer, blend together everything but the prosciutto. Once the mixture is smooth, add the prosciutto and stir to combine. Cover and refrigerate until ready to use, or up to one day. Have two regular sized muffin pans ready along with 4-5" round or fluted cutters. 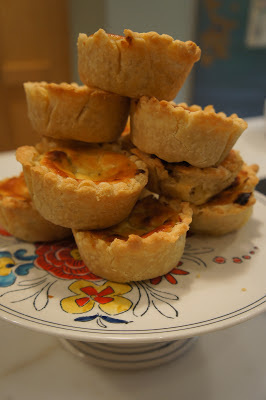 The round cutters I had were not quite large enough, so I used my fluted individual tart pans. Take the dough out of the refrigerator, unwrap and place onto a well floured work surface. Roll the dough out until it is about 1/8" thick. Using the rounds, cut the dough into as many circles as will fit. Place the rounds into the muffin tin and gently press them into the molds. If the dough tears, pinch it back together. You can press the edge of the dough slightly onto the edge around the top of each mold. When finished with one tin, place it into the refrigerator while you finish with the other. With the dough scraps cut from rounds, knead together to form another ball and roll it out again to 1/8". Cut additional rounds. Scoop about 3-4 tablespoons of filling into each mold. Refrigerate for at least 30 minutes before baking. Heat oven to 375f. Bake for about 20-25 minutes, until the filling is golden brown and puffed, but still slightly jiggly. Once cool enough to handle, pop them out of the muff tins and set onto a rack to cool. These will keep up to two days at room temp. I came up with 17 pie crusts but only enough filling for 12. So, for the remaining 5, I made a mixed berry fruit filling with a granola crumble topping. The cheese pies were creamy, soft and cheesy. Right up my savory alley. I think the kids enjoyed the fruit pies more though. Maybe Chris, me and Pacino as well.